A wondrous example of faith and faithfulness to Christ is presented to us by the Church on the second Sunday after Pascha, as it commemorates the holy Myrrh-bearing Women. These staunch women, who supported Christ with their estates and with their care during the years of His public service, did not leave the Lord even at the cross, when fear of their enemies forced almost all of the apostles to go into hiding. The women remained with the crucified Saviour until His very end; they accompanied the transferring of His body to the sepulcher and were present at His burial; and now, despite all the terrible trials of the preceding days, they hastened to render to their dead Master their last homage of love and esteem. And yet they went. Why? What mighty force impelled them? This force was their strong love for their Master, which compelled them to fulfill the Word of God as expressed in the law of Moses. And thus, in fulfillment of what for them was a holy law, they bought sweet spices and went to anoint His Body. And so, their strong faith in the Word of God, their strong love for their martyred Master, and their strong hope in God’s help turned out to be more powerful than fear, more powerful than reason, more powerful than everything on earth. And what happened? Mary Magdalene, who had been healed by the Lord of the terrible affliction of possession by demons, hurried before the other women and reached the sepulcher while it was still dark. Peering through the darkness of night and seeing that the stone had been rolled away and that the guards were not there, Mary Magdalene did not lose a single moment, but immediately ran off to pass on the news to the Lord’s closest disciples, Peter and John. It was already daybreak, and the golden rays of the sun were beginning to disperse the darkness which enveloped the garden of the righteous Arimathean, when the other pious women approached the sepulcher with a heavy heart. Their Master was dead, but their love for Him had not died, – it was this love which made them grieve that they would never see Him again, never hear His wondrous words. And they grieved even more as they thought of the heavy stone which sealed the sepulcher and which it was beyond their power to roll away. 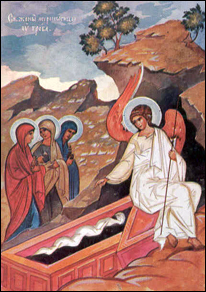 The myrrh-bearing women, shaken and frightened by the heavenly apparition, ran away from the sepulcher and did not say anything to anyone at first. Afterwards, when their fear subsided and was replaced by joy, they hastened to share this joy with the apostles, as the angel had bidden them. What joy! What a reward for faith and faithfulness! Out of all the people in the world, including Christ’s closest disciples, these myrrh-bearing women were the first (after the Mother of God) to learn of Christ’s resurrection. Moreover, they were also the first to see the risen Christ. And here again, the most ardent of them – Mary Magdalene – preceded the others. After having imparted her amazing news to the apostles Peter and John, Mary Magdalene, who had not heard the angel’s words and was still unaware of Christ’s resurrection, returned once more to Joseph’s garden, where she stood at the sepulcher and wept. All the inner suffering and anguish that she had experienced over the past several days now culminated in this loss of her last consolation – to lament over the body of the Master. The grieving Mary leaned over into the sepulcher to look at least at the place where the Saviour’s body had lain. And suddenly an extraordinary sight presented itself to Mary’s tear-filled eyes: she saw two angels in white garments, sitting one at the head and the other at the feet of Christ’s bier. At this moment the Lord suddenly appeared behind Mary and amazed the angels, who revealed their surprise with looks and gestures. Seeing their movement, Mary also turned around, but being far from any thought of Christ’s resurrection, the weeping Mary took Him for the gardener, and in response to Christ’s question: “Why art thou weeping? Whom art thou seeking?” – Mary turned to Him with a heartfelt cry: “Sir! if Thou hast taken Him out, tell me where Thou hast laid Him and I will take Him.” And here a very moving and heart-wrenching moment occurred. Jesus said to her: “Mary!” The Lord’s familiar voice pierced the heart of Mary Magdalene. Quickly turning around and looking closely, she recognized Christ and cried out rapturously: “Master!” The Lord then bade her to go to the disciples and tell them not only that He was risen, but also that He would soon ascend to His Father. After appearing to Mary Magdalene, the risen Christ also appeared to the other myrrh-bearing women, as they were going to the apostles with the news of the resurrection that they had received from the angel. The Lord met them on their way and greeted them with the words: “Rejoice!” The holy women came up to Him, and held Him by the feet, and worshipped Him. The example of the holy myrrh-bearing women is of great significance to us not only in a spiritual sense, but also in a very concrete social sense. In our modern life we constantly come across the “women’s liberation movement,” we are constantly bombarded by shouts of “freedom for women,” “equality for women.” Alas! As with all other contemporary movements, the question of “women’s rights” has been distorted and pushed to the level of absurdity. Let us look at what the fight for women’s freedom and equality is all about. Contemporary social science has declared that the traditional role of woman as wife and mother is regressive, that a woman is fettered in this role, that it suppresses all possibility for a woman to manifest her talents, her ability to play a leading role in society, and to influence public life. The underpinning of all these arguments is that women are absolutely equal to men in ability, and that a woman’s freedom is constrained if she is deprived of the possibility to show her abilities in the same domains as man. Now let us look at what the myrrh-bearing women would tell us about this matter. While serving Christ, they did not leave off their traditional family responsibilities. They had no legal voice and could not stop the judgment proceedings against Christ (and thus could not “hinder” His sacrifice for mankind!). At the same time, they had complete freedom and equality to become the followers of Christ and to remain faithful to Him even unto His death and beyond. They did not consider themselves equal to men – Christ’s disciples, and yet they turned out to be nobler and braver than the men. When the Lord was taken by the Jews, the disciples all scattered, while the myrrh-bearing women accompanied Him to the crucifixion. The disciples ran away in fear, while the women compassionately followed Christ along the way of the cross. The disciples remained behind locked doors, while the women fearlessly went out at night to the sepulcher. The disciples did not believe in the news of the Resurrection, while the myrrh-bearing women were the first to see the risen Christ. Again, this is not to say that women must be extolled above men. The myrrh-bearing women are a vivid example to us of the fact that true freedom and true equality are to be found not in social or civil conditions, but in the spiritual world, and that only in Christ are all people transformed, all become equal. It was thus that the young girl, Saint Barbara, was able to withstand the rude force of her father and the power of the Roman persecutor, in order to attain the glittering crown of great-martyrdom. It was thus that the great-martyr Saint Catherine, by means of her divine wisdom, was able to triumph over the sagacity of the best pagan philosophers of her time. These two great female saints are truer witnesses to female liberation and equality than modern feminists. In the words of the Apostle Paul, only in Christ are there no differences: there is neither Jew, nor pagan, neither free man, nor slave, neither male, nor female, but all are equal. In social terms, though, people are definitely not equal, but all have their place and their assignment in life. And it is only by staying in one’s place and fulfilling the assignment given to one by God that each person – both man and woman – can make full use of one’s talents and abilities by becoming part of the divine harmony and God’s providence in the world. Both sexes have been created by God and have been created differently, but between them there has been established such wondrous harmony that together they form a magnificent whole. For example, in a family that lives according to divine laws, the relationship between man and woman is comparable to the relationship between the sun and the earth. Just as the earth produces life and the sun sustains this life with its light and warmth, so the mother bears life (the family), while the father supports and protects it. Contrary to modern teaching, the role of mother of a family not only does not fetter a woman or make her incomplete, but it is in this role that she wields the greatest power, has the greatest importance, and even influences world history. It has rightly been said that the hand that rocks the cradle rules the world. It is not surprising that the righteous mothers of the greatest Church Fathers are themselves honored as saints. It is the women who have been given the power to bring up their offspring as future citizens of the heavenly realm. Before us we have the wonderful example of the Saint Queen Helena, who not only toiled in the Lord’s vineyard extensively herself, by reconstructing His sacred sites in the Holy Land, but also raised a son, Emperor Constantine the Great, the first Christian emperor, who transformed the persecuted Christian faith into the state religion. Or here is another example, closer to us in time, – the Saint Princess Olga, who sowed the seeds of faith in her grandson Vladimir, who became the godfather of the Russian people and, like Emperor Constantine, gave the future Russian Empire the true faith – Orthodoxy. These two female saints would only laugh at the feminists’ complaints about the persecution of women. But where are these complaints coming from? If we examine the underlying cause of the women’s liberation movement from a spiritual point of view, we will clearly see that its mainspring is pride! The great work that has been entrusted by God to women – raising future citizens of heaven – is performed in a Christian atmosphere of humbleness and self-sacrifice, i.e. usually without financial recompense or worldly recognition. But pride cannot tolerate humbleness, and this has been quite successfully used by the enemy of mankind, who himself fell through pride, and so he created a situation that is as old as man. Eons ago, soon after the first people were created, Satan the tempter, hating this new and beautiful creation of God and wanting to destroy it, whispered to Eve that if she and Adam tried the forbidden fruit, they would become as gods. Eve was overwhelmed with pride, and believing in the false promise, she destroyed mankind. A similar situation has now occurred: the very same tempter, trying to destroy entire families, has promised modern eves power and fame, and the poor deluded women have abandoned their hearths, betrayed their assignment on earth, submitted their children to an upbringing by strangers that is often hostile to Christianity, and have run after the chimeras of “equality” and “freedom,” not seeing that they have run straight into the enemy’s trap.